V-170 — German Tier IV destroyer. The lead ship in the last series of destroyers laid down for the Imperial German Navy. She retained the main armaments of G-101 class destroyers, but featured an increased displacement and a higher speed. Highest rate of fire of all Tier IV destroyers. Much stealthier than her predecessor, G-101. Small but comfortable window from which she can fire torpedoes beyond her detection range. Maintains the forward firing torpedo launchers of the G-101 and the V-25. Front two main battery turrets can rotate 360 degrees. V-170 doesn't have any really stand-out module upgrades. Hull (B) is probably the best bet to start with; extra hit points are always useful. The Fire Control System module should come next to improve her main battery range. The Torpedo upgrade can be saved for last or skipped entirely. 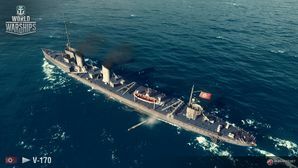 Players looking to quickly grind down the German destroyer line should mount the following signals: Equal Speed Charlie London ( ) for faster XP gain, Sierra Mike ( ) to compensate for her rather slow speed, and Zulu Hotel ( ) for faster commander retraining if the player transferred the commander from G-101. Juliet Whiskey Unaone ( ) is not recommended as battleships at this tier do not have very much torpedo protection and V-170 has quick-reloading torpedo tubes. The torpedo arcs on the V-170 enable her to engage two battleships at once. The Smoke Generator consumable enables the V-170 to sit in smoke and fire at the enemy with no threat of retaliation. An enemy Kawachi class battleship is the next victim. No ships of this class were ever constructed. SMS V-170 was to be the lead ship of the V-170 class, regard overall as Grosse Torpedoboot 1917. The last Grosse Torpedoboot ordered by Germany, 53 ships were ordered and divided into 5 subclasses built by three different shipyards; Vulkan Stettin built the "V" subclasses, Schichau Elbing built the "S" subclasses and Howaldtswerke Kiel built the "H" subclasses. The main armaments of these ships were the standards for German destroyers; four (4x1) 10.5cm main guns and six (2x1, 2x2) 50cm torpedo launchers, with the only upgrades to the armament being 40 mines. These ships were to be the first German destroyers with geared turbines, capable of putting out 34,000 shaft horsepower and propelling the ships at 35 knots. However, despite 53 ships being ordered, all but 4 ships were either scrapped in the shipyards or cancelled before construction even began, as the war wound down and Germany later surrendered. Of the four surviving ships, SMS S-178 was completed as sailing ship Franziska Kieme and was later sold to Brazil, SMS S-179 was completed as sailing ship Georg Kimme and was later sold to France, SMS H-186 was completed as transport Hansdorf wand was later sold to Brazil, and SMS H-187 was completed as transport Hoisdorf and was later sold to Brazil as well.